The pH of natural waters is rarely outside the fairly narrow range of 4.5 to 8.5. High values, at which corrosion of steel may be suppressed, and low values, at which gaseous hydrogen evolution occurs, are not often found in natural waters. Copper is affected to a marked extent by pH value. In acidic waters, slight corrosion occurs and the small amount of copper in solution causes green staining of fabrics and sanitary ware. In addition redeposition of copper on aluminum or galvanized surfaces sets up corrosion cells resulting in severe pitting of the metals. Corrosion and the toxicity of potable water. Find and discuss various cases where corrosion processes have freed some toxic compounds in potable water. From a corrosion standpoint, the most significant contaminant is dissolved oxygen (DO) from ambient air. This is illustrated in the following Figure. Oxygen is a cathodic depolarizer that reacts with and removes hydrogen from the cathode during electrochemical corrosion, thereby permitting corrosion attack to continue. Effect of oxygen concentration on the corrosion of low-carbon steel in tap water at different temperatures. 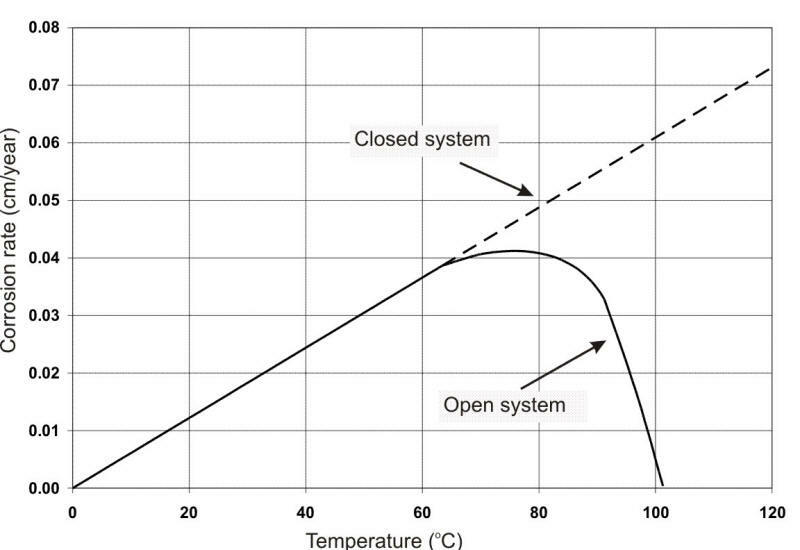 The effect of oxygen on corrosion with increasing temperature is also shown in the following Figure, indicating the results in a closed versus an open container (the latter permitting natural deaeration by ebullition). In a closed vessel, corrosion continues to increase with temperature, whence the requirement for removing DO from hot water systems and boilers. Effect of oxygen on corrosion of steel. Other constituents that contribute to corrosion are chlorides and carbon dioxide, possibly calcium, as will be explained later, and sulfides or ammonia from industrial or natural sources. Of course, many other man-made contaminants can be found in local areas if industries are permitted to discharge their waste products into water resources. As with other chemical reactions, corrosion increases with elevated temperature, unless stifled by insoluble scales, the removal of corrosive gases, or the addition of corrosion inhibitors. The formation of scale on a surface can be positive by providing an excellent protection of the substrate or negative by accentuating pitting at pores, cracks, or other voids in the film. If the film attains any significant thickness, the loss of heat transfer through the metal and deposited scale can also be a problem in certain applications. Thus, the development of scales on metal surfaces is an important consideration when using metals in waters. 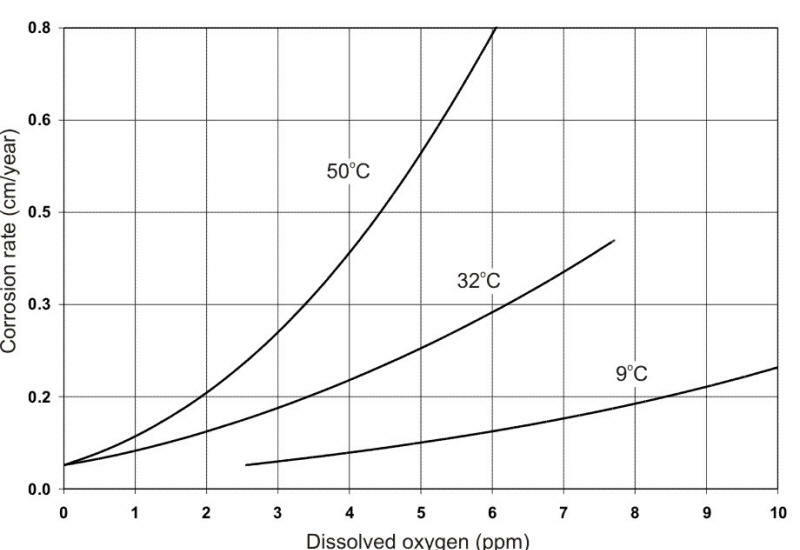 The effect of oxygen and pH on the corrosion rate of steel at two temperatures is shown in the following Figure. Corrosion of steel in water containing 5 ppm of dissolved oxygen at two different temperatures as a function of the water pH. In a broad range of about pH 5 to 9, the corrosion rate can be expressed simply in terms of the amount of DO present (e.g., µm/y per ml. DO per liter of water). At about pH 4.5, acid corrosion is initiated, overwhelming the oxygen control. At about pH 9.5 and above, deposition of insoluble ferric hydroxide tends to stifle the corrosion attack. Amphoteric metals also show an increase in the corrosion rate in alkaline environments. Aluminum and lead are examples of amphoteric metals. 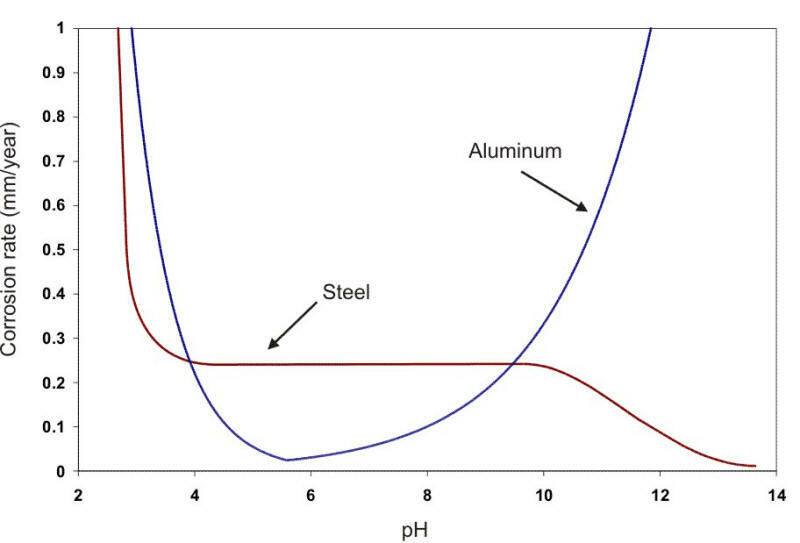 The following Figure shows the behavior of steel and aluminum as a function of pH. 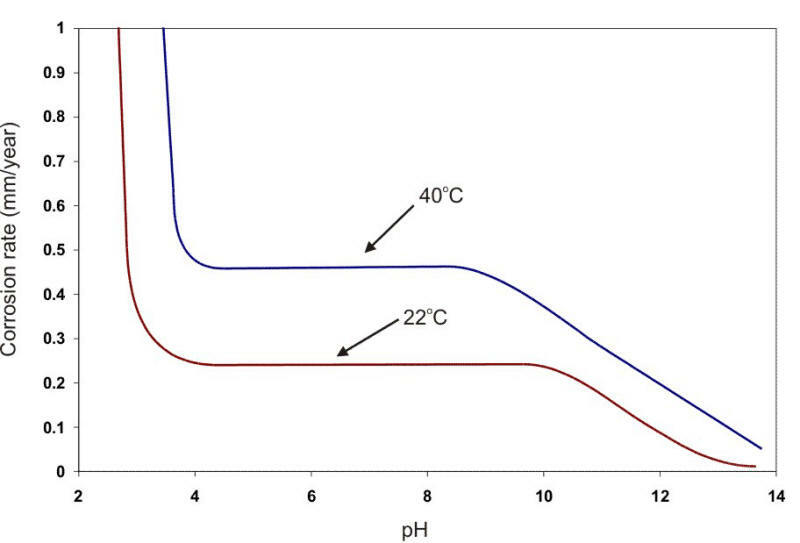 Corrosion of steel and aluminum as a function of pH at the same temperature (22oC).